The fact that its installations were incontrovertibly revealed to function as rocket arsenals is only one aspect of a greater travesty. The rockets were handed right back to Hamas in a number of instances and UNRWA appears complacent about the fact that its facilities were also used to launch rockets at Israel or to fire on Israeli troops (thereby inevitably drawing back fire to supposed safe-havens). Many UNRWA personnel, moreover, are closely tied to Gaza’s powers-that-be and are no well-meaning do-gooders. Twenty-five of the 27-member UNRWA executive in Gaza are Hamas activists. This figure speaks volumes. 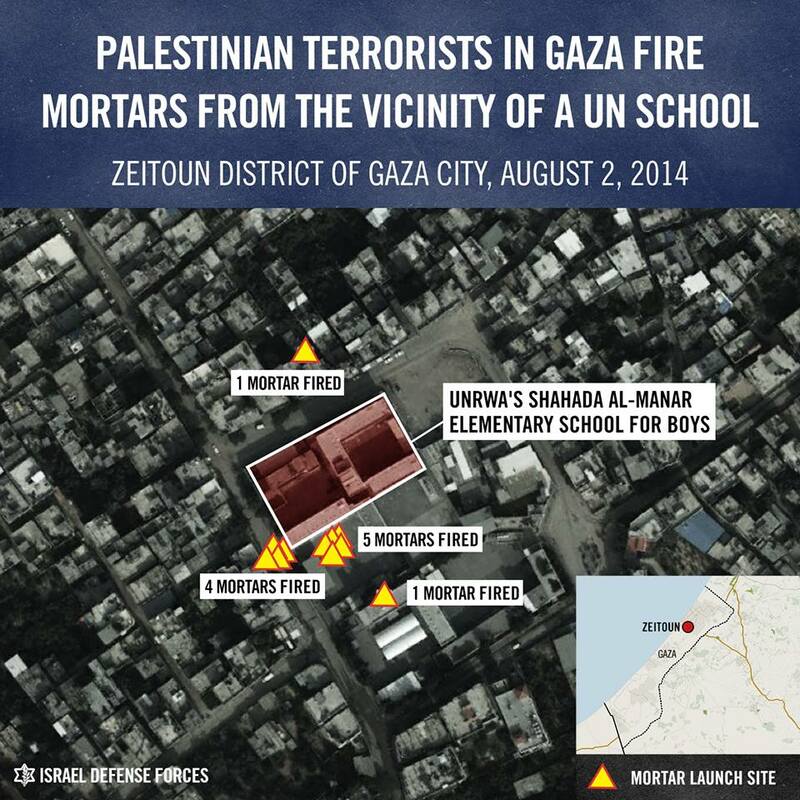 UNRWA schools are infamous for facilitating Hamas indoctrination. Gunness’s demand is also disingenuous for failing to mention cause and effect. It accuses Israel of “collective punishment of the 1.8 million Palestinians packed into Gaza.” To the uninitiated it sounds as if this is all a product of capricious Israeli malevolence. There’s no mention of what it was that caused Israel to impose the blockade, nor of what happened within Israel proper when no such blockade was in force. The fact that Israel allows food, medications, electricity and water into Gaza at the very time in which Gaza rockets Israeli population centers is also missing from Gunness’s portrayal of the situation. But this isn’t unexpected. UNRWA’s very mandate is an aberration. The UN established a special agency in 1949 for those deemed to be Palestinian refugees, as distinct from all of the world’s bona fide refugees. All other refugees, regardless of degree of plight and objective hardship, are looked after by the UN High Commission for Refugees (UNHCR), while the privileged Palestinian category is singularly served by UNRWA. UNRWA is calculatingly exploited to prevent refugee-offspring from losing their refugee status, thereby creating the greatest obstacle to the ostensibly desired peace. UNRWA helps keep alive and fan the ambition to inundate Israel with millions of so-called refugees, while paying lip-service to a two-state solution. This becomes self-evident when we consider the different definitions for “refugee” to which UNHCR and UNRWA subscribe. UNHCR’s refugee is one who “owing to a well-founded fear of being persecuted…is outside the country of his nationality.” By this definition the refugee’s descendents aren’t refugees. Florida-born children of Cuban refugees are no longer considered homeless. In 1948 there were some 600,000 self-styled Palestinian refugees. UNRWA now boasts that it cares for 5,000,000. Its budget for 2014 is USD 14bil, versus USD 5bil for UNHCR (saddled with the rest of the world’s refugees, including those from Syria and Iraq). UNHCR has 5,000 employees; UNRWA has 30,000 (90% of whom are Palestinians). With so many layers of unabashed hypocrisy overlapping and contributing so cynically to the perpetuation of misery instead of assisting the cause of peace and prosperity, it’s time to regard UNRWA as a problem in and of itself. This region would be better off without UNRWA. UNRWA is a CRIMINAL organisation in the service of Arab terrorists, an unfinished leftover from the war of independence. It should finally be REMOVED ! At last – an expose of the true UNWRA written by an accomplished and distinguished journalist with credibility and gravitas, prizing open the hypocrisy and duality of this laughable self perpetuating organisation. This revolting cabal of miscreants that appear to be run by a duplicitous, conniving, self serving and self justifying bunch of delusional misfits who bend the truth and facets to suit there aims and those of their supporters. A bigger bunch of self preening, holier than thou procrastinators I have yet to encounter. In the final analysis they have achieved nothing, zilch, “bubkes” other than to apply their U.N. budget diligently year in and year out in their biased and vindictive criticism of Israel couched in the language of politics and diplomacy. United Numbskulls Without Respected Accountability. Actually, in the case of stateless persons, UNRWA also recognizes second and third generation refugees as refugee as refugees–a category known in refugee practice as “derivative status.” For example, many of the refugees returning to Afghanistan post-2001 were subsequent-generation refugees. Consequently, UNHCR and UNRWA practices are functionally similar, as any UNHCR official will tell you. The only real difference is Jordan, where most refugees are citizens and would not be refugees under UNHCR rules. However, both Israel and the US have a strong strategic interest in aiding Jordan, and thus have not made an issue of this. UNHCR also favours the return and repatriation of refugees as its preferred “durable solution,” which is not Israel’s preferred solution. Very few UNHCR refugees are ever resettled (only about 1% are put forward by UNHCR for resettlement each year). Certainly the three violations of UNRWA’s neutrality by Hamas reported in the media during the Gaza conflict are cause for concern, although they are the first such violations in the past 25 years. Indeed, during that same period there were far more cases of the IDF using UNRWA schools for military purposes in the West Bank, usually as temporary detention centres or observation posts. In most cases UNRWA dealt with these quietly, since its on-the-ground relations with the IDF can be quite good. Indeed, while there is considerable criticism of the Agency, Israel finds it a valuable asset. UNRWA acts as a political rival to Hamas in Gaza, drawing kids away from Hamas schools and into UN- and US-monitored ones that use the same Palestinian curriculum Israel uses in Arab schools in East Jerusalem. Were in not for UNRWA IDF operations in urban Gaza would be much more difficult, for there would be nowhere for civilians to shelter. UNRWA food aid also makes the blockade possible by making sure there is no widespread malnutrition. Perhaps most tellingly, when Canada ended support for UNRWA in 2009, the Israeli government did not praise the move. Instead, it requested Ottawa renew such aid, and indeed expand it.